This page has Wedding Information about Pipers, wedding arrangements, kilt hire, attire, accessories, bagpiping and more.. 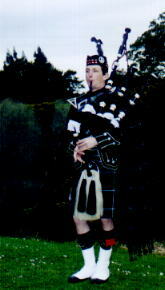 The wedding Pipers can play Scottish and/or Irish tunes for your wedding theme. We can dress for the occasion from different styles of Highland or Irish dress. even if we have to search out or transcribe the music. Various functions a piper may perform at a wedding. 1.........Play while guests arrive and stop within 5 minutes of the time the bride is due to arrive. 3........ Pipe while the bride disembarks from the bridal vehicle and prepares for entry into the church. ... (a..... continue to lead the procession down the aisle. This is suitable for larger churches, cathedrals or outside ceremonies. ... (b..... halt at the entrance, but continue to play as the procession moves down the aisle. ... (c..... or play outside the church until the bridal procession reaches the end of the aisle. This option is useful for small chapels. 5........ Once the vows have been taken, the piper can play appropriate tunes while the marriage register is signed and witnessed. 6........ When the couple are ready to exit from the registery, they can be piped back down the aisle to enter the world as a married couple. 7........ The piper can simply play as the couple emerge from the church, and while all the guests also emerge. There would then be an appropriate pause for the various socialising activities outside the church. Playing can continue at a discrete distance. This provides unobtrusive background music while guests gather around to congratulate the couple and while the usual family photographs are taken. 8........ 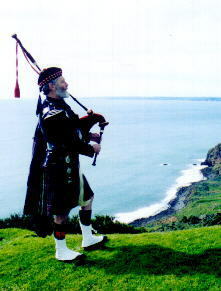 The piper can be included in the wedding photos if desired, to add colour and cultural interest. 9........ Play as the bridal couple drive away in the bridal cars by..
... (b...... from one point while the bridal car(s) drives away. 10...... A photo of the piper with the newly wed couple generally concludes the piping requirements. 11........ The Reception. (Additional to the Wedding ceremony). 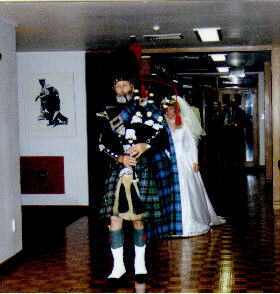 The piper may also be required at the reception; for piping in the couple to their table, or piping in the wedding cake, and occasionally a haggis as well. Perhaps also playing for dancing (waltzes, reels, quicksteps, jigs, hornpipes, step, set and ceilidh dancing etc..). This is normally at additional cost. Sometimes this is an alternative to having a piper at the actual ceremony. Aboard ship / vessel, ashore - shoreline, island, bay, estuaries, caves. Weddings aboard ships/boats are not as common but add the nautical atmosphere for those folk who love the sea. Pipers are just as at home at sea as on land. It has been suggested that the first music heard in NZ from Capt. Cooks ship was that of the bagpipes as he was known to have a piper on board. Pipe music carries beautifully across bays, estuaries and the sea. 1.........Play while guests arrive and board the vessel. Stop playing within five minutes of the time the bride is due to arrive. 2........ Pipe the bride along the foreshore, jetty or wharf to the point of embarkation, and while her entourage boards the vessel. The piper can play from the jetty or wharf as the vessel sails. This may be all that is required, or the piper may be required aboard, to perform at any stage during the voyage and the ceremony. 3........ The Wedding march (equivalent). Depending on the size of the vessel and whether the ceremony is done afloat or ashore at some secluded bay, the piper can provide a magnificent contribution to the occasion. .......... Play while sailing/motoring into the bay for mooring. .......... If the ceremony is being done ashore, the piper can play the guests ashore and then pipe the bride ashore and along the beach/foreshore etc. ........... Play for the signing from for'ard on the vessel or somewhere on the shore (promontory, cliff top or base, beach etc). ........... Play for the guests entertainment while ashore on the foreshore or beach and also while guests re-embark. 6........ Anchors a weigh and sailing. ........... Play as the anchor is weighed and the vessel sails out of the bay on the homeward voyage. Play as the vessel returns into port and berths. The Seafarers option involves much more time for the piper. Times are usually dictated by suitable tides (and weather). Costs are therefore higher but the contribution bagpipes can make is very significant, versatile and enthralling. Check out The Pipers Role. Ribbons are available in the following sizes: 10mm, 16mm, 25mm, 38mm, 75mm. An alternative (but more costly) option is to purchase some lightweight plain weave tartan fabric and cut it into strips to make your own ribbons. Kilt, Craill Jacket, Tie (Bow or other), Waist Belt, Dress Sporran, Hose & Garters. Normal dress (black) shoes can be worn. Refer to our Hire pages for more info. the same or different tartans? Suits are always the same colour and style. Kilts are far more flexible and striking. Multiple tartans add vibrancy, interest, colour and individuality. They enhance the overall impact of the entire wedding party. The potential choice for co-ordinated colour variations in decoration on bridesmaids dresses and accessories is enhanced. If the grooms party all wear the same tartan there is a tendancy to look like a dressy army platoon or pipe-band with out instruments. However if the grooms party are all related and would wear the same tartan, that is a good reason to wear identical kilts. In this case consider variation through use of different shades - Ancient, Modern, Muted, Dress, Hunting etc.. The groom could choose to wear the more formal tones, or the more individualistic. The formal black jackets with silver buttons, worn with long kilt hose and same style shoes (eg Ghillie brogues) provide all the conformity and co-ordination required for the grooms party. Different tartans create interest and introduce many additional subjects guests will love to discuss, further enhancing the wedding and friendships. Different tartans add colour and interest to the photographic record of the wedding day. Avoid sombre or dark photographs. Some people are shy about wearing brighter tartans so opt out by selecting the Black Watch tartan. To avoid sombre photos consider; the same tartan background is used in many tartans, including Gordon, MacKenzie, Campbell of Argyll (the Black Watch or Government sett is a Campbell tartan). The overstripes in these tartans provide lift and highlight to photographs, so enhancing the photographic record of a wonderful day. Photographs are an important long term record and outlast the actual day itself ~ ensure they are interesting and fun to look at. Once they enter family archives they may even outlast you and the different tartans will always attract interest. Wedding Ceremony with a difference. Many couples select their own format, be it in church, a garden setting or elsewhere. Often the intention is to be different, but within the traditional concept and format for a wedding. There is no doubt at all that the bagpipes add impact and a cultural dimension that gives the specal day very tangible extra emotions. Also weddings that genuinely include God, as understood in by a Christian perspective, have the feel of an extra special spiritual blessing. Here is a variation that adds very significantly to the effect of the day, common to weddings overseas, but now uncommon to most weddings in New Zealand. When the formal part of the Wedding Service ends the couple with their witnesses proceed to sign the register. While the signing takes place the guests leave the church and assemble outside where they wait to greet the couple as they emerge. While the guests move outside there is plenty of time for a medley of pipe tunes or alternative organ music, or even singing. The piper can play from outside or inside with equal ease and effect. After the signing the witnesses may also go outside while the bride and groom wait inside, or they can wait to follow out after the bride and groom and the piper. The couple is led out of the church by the piper playing a selected pipe tune. The couple emerge through the church doors to be greeted en-masse by all their friends, relatives, guests and well wishers. To emerge to a mass of joyful faces full of anticipation and smiles is particularly emotional and heartwarming. The piper moves off to a discreet distance, still playing, and continues playing a medley of suitable tunes. The effect is a wonderftul climax to the formality of the ceremony. Much better than emerging to an empty forecourt and then waiting for the guests to filter out after them. Our choice for the Hamilton Celtic Christian wedding of 2000. Your Wedding is ahead and time is ticking away. Here is a schedule of suggested things to consider. (Omissions are not our responsibility). Don't overcomplicate your wedding day. It is simply the day on which two individuals publicly express their love and desire to commit to llive together as man and wife before God, family, friends and community. It must be this, before the aggregation of material gifts, reward, position or politics. If it involves more; such as a political convenience, a display of power, influence or wealth, the immediate accumulation of materialism and the like, then you will need effective organisation and spiritual guidance. A significant number of Wedding Planning Packages now exist. They are based on Project Management skills and computer Project Management software packages that were developed for commercial projects. The aim of many "pre-set" plans seems to be commercial commitment, especially those based on American concepts, to prise the most expensive wedding out of the couple, their family and guests. Wedding customs are/were quite different in NZ, but like the penetration of TV and it's effect on our culture, American Wedding Planning software and crass commercial and materialistric attitudes have an ability to distort the essentials. It would probably be easier to encourage people to elope off to Gretna Green* and to dispense with the commercialism and greed. But in reality good organisation makes things run much smoother. If you need a package, make sure it can be "localised" (altered or setup for New Zealand requirements), and make use of it. Just don't forget a wedding actually has a very simple aim, and should involve romance and commitment. It need only involve the couple, the minister or celebrant and a witness, and some form of celebration afterwards. So tailor the day to what you want and try to avoid the stress of being pressured in to something you cannot control or do not want. *Gretna Green, a town just over the border in Scotland, was where many couples from England eloped to get married. Scottish law enabled weddings to take place in a matter of urgency without family approval. The couple only needed to declare their marriage before two witnesses, rather than four weeks (ie the week after the reading of banns over three consecutive Sundays in their parish Church) and with family approval. The bride could also be younger (16 instead of 20). The Smithy at Gretna Green became famous for such marriages. Any Scottish border town was as useful to eloping English, but not all roads were as convenient as the one on which Gretna Green is situated. It was on the stagecoach route from London to Edinburgh. Laws have changed and the significance of Gretna Green has dwindled, but it still has a certain romance associated with it and the "Smithy" is still there. Gretna Green is on the other side of the world to New Zealand and the cost of air tickets to get there would go a long way to having a lot of fun at a wonderful New Zealand wedding venue instead. Highland Piper Service ~ Scottish & Irish Tunes. and the kilt worn can be from a choice of tartans. Refer to our piping pages. Kilt Hire for the Groom and groomsmen, or members of the family. Tartan by the metre, for waist coats and other items of clothing. Kilt Making and outfitting, for waist coats and other items of clothing. Tartan ribbons to decorate: vehicles, cakes, invitation cards or venues. CUSTOM MADE ITEMS FOR YOU. Your own personal kilt for your wedding? A growing trend. You will find your own kilt is likely to be used regularly in the future too. Today a kilt is perfectly reasonable attire for going out in the evening, to restaurants, theatre, the races, family get togethers, etc. Our standard design is the Feilidh Beag (the small kilt, which is the most common form of kilt today), but also a modern form of the Feilidh Mor (the great kilt - the "Brave Heart" look) is also available. Leather Sporrans to your design, or one of ours. Brogue shoes conversion into Ghillie brogues can also be made to order. Many pipers in NZ pipe-bands wear ghillie brogue conversions. Recently some have been done for customers in Australia too. Other accessories, Kilts, tartan cloth, cummerbands, waistcoats, sashes, belts, sporrans, clan badges etc.. may be procured from or through us. A great option for your reception. A wonderful way for everyone to round off your special day. If you need contacts for Ceilidh bands, Highland dancing, Scottish Country dancing, Scottish and Irish set and step dancing, Dance calling and singers. Breton and Nova Scotian dance styles too. Ask. Have you been along to the Celtic sing-a-long and jam session at "Biddy Mulligans Irish Pub" in Victoria St, Hamilton? Every third Sunday from late in the afternoon. Bring your "celtic" musical instrument, your voice, and your friends. Go to our Other Links page 1. Marriage Celebrants: You can be listed on these pages. Enquire. Aldridge, Janet : 27 May St., Hamilton. Cole, Barry: 848a Beach Rd., Browns Bay, Auckland, barrycole@xtra.co.nz Ph: 021 772 359 Marriage celebrant. Personalised ceremonies for all occasions. Theme ceremonies, Weddings afloat, All areas Northland, Auckland,Waikato. Dearing, John: 61 Lake Rd.,Devonport, Auckland,. Erickson, Parvati: MacNaughtons Road, RD3., Waiuku. Ph. (09) 235 9624 Asian Indian wedding ceremonies. Fellingham, D. Wayne JP. Celebrant, 6 Glencoe Pl, Grandview, Hamilton. Foreman, Yvonne: 475 River Road, Hamilton. For your wedding ceremony, your way! I encourage you to have a ceremony that reflects your feelings, beliefs and personality. I will listen to your ideas and work with you in a friendly, professional manner until your wedding ceremony is the way you want it - beautiful and extra special. Wedding ceremonies individually designed for you, traditional and contemporary ceremonies to highlight the story of your love. If you contact any celebrants as a result of finding them here, please advise them where the contact originated. Reception Hosts: You can be listed on these pages. Enquire. Your hosts: The Mathiesons would be delighted to share their rural venue with you for your function. and the Lake Karapiro Rowing Centre. If you contact any venues as a result of finding them here, please advise them where the contact originated. Bridal Boutiques: Do you have Scottish/Irish or Celtic styles? You too can be listed on these pages. Enquire. If you contact any boutiques as a result of finding them here, please advise them where the contact originated. Photographers: You too can be listed on these pages. Enquire. If you contact any photographers as a result of finding them here, please advise them where the contact originated. Do you play for Weddings and other functions? You too can be included in our lists. Enquire. If you contact any pipers as a result of finding them here, please advise them where the contact originated. Further Information. : Our link pages include links to Australian and UK wedding directory sites.